Sugar may taste delicious, but it’s HORRIBLE for your health if not consumed in careful moderation. We recommend minimising sugar intake as much as possible to stay healthy as well as to improve your physique. Check out this article for our tips on beating sugar cravings! The truth is that sugar is EVERYWHERE and it’s hard to avoid. 1. Damages your teeth – What’s the point in creating an amazing physique if all your teeth fall out!? Eating sugar feeds the bacteria in your mouth, giving them the nourishment they need to attack your tooth enamel and burrow into your gums. Sugar is the leading cause of oral health problems in the world today. 2. Promotes obesity – Sugar is completely devoid of vitamins and minerals, and yet it’s high in calories. Not only are you eating food that is giving your body NOTHING in the way of nourishment, but it quickly adds to your daily caloric intake. Too many calories will lead to a gain in body fat and eventually lead to you being overweight! 3. Overloads your liver – When sugar enters your body, it is sent to the liver for processing. It is turned into glycogen to be shipped off to the muscles and organs, but excess sugar can be stored in the liver as fat. Eventually this can lead to non-alcoholic fatty liver disease causing the liver to become inflamed and lead to scarring which can impair liver function. 4. Causes insulin resistance – Insulin is the hormone produced by your body when your blood sugar increases after a meal. Insulin reduces the amount of glucose in your blood by helping your muscle,fat and liver cells to absorb it. The more sugar you eat, the more insulin your body has to produce. The more insulin that is produced, the less sensitive your body becomes to it. Eventually, you become desensitised to insulin, which can lead to both metabolic syndrome and diabetes. 5. Can lead to cancer – Sugar causes acidity in the human body, creating an environment in which cancerous cells can thrive. Sugar also reduces your body’s sensitivity to insulin, a hormone that helps to prevent the spread of cancer cells. Sugar causes inflammation in the body, which can be a contributing factor in developing cancer. 6. Leads to fat gain – Sugar can greatly increase your caloric intake which can lead to obesity. In addition to this, consuming sugar can also wreak havoc on your appetite and make you eat even more food than you usually would. When you consume high-glucose foods, you don’t feel as satiated as you would after eating a high-fat or high-protein food. This may cause you to overeat and a caloric surplus will lead to fat gain. 7. 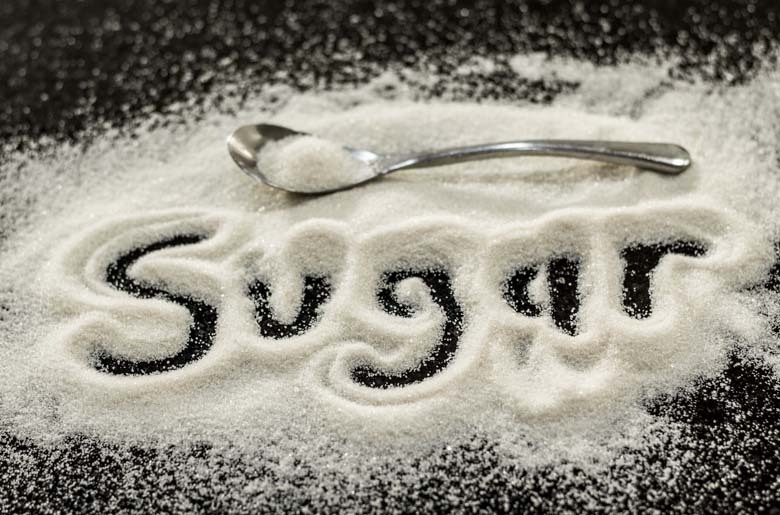 Causes addiction – Yes, sugar is massively addictive! When you eat sugary foods, your brain releases a chemical called dopamine. Dopamine is a “feel good” chemical, and you come to crave that feeling once the sugar has left your body. This is why most “comfort foods” are packed with sugar and why most of the food cravings that you experience are for sweet foods. You’re not craving the sugary food itself, but you’re craving the good sensations that are produced by your body in response to that food. 8. Gives you heart problems – Sugar can cause a rise in your bad (LDL) cholesterol and a decline in your good (HDL) cholesterol. Having more LDL than HDL cholesterol can lead to a buildup of plaque and hardening in your arteries. This can pose serious risks to your health so it’s important to try and minimise LDL and maximise HDL cholesterol.